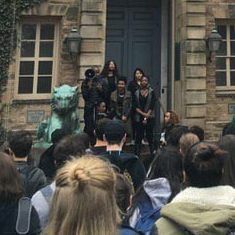 Students at universities across the nation participated in #StudentBlackOut today, an action organized by a new group called the Black Liberation Collective. BLC was inspired by the University of Missouri and Concerned Student 1950, who recently demanded (and received) the resignation of that school’s president over what they saw as his insufficient response to racism on campus. “We hope that Black students organize and participate in actions that really challenge white supremacy and anti-blackness on their campuses,” UConn student Yamiesha Bell, one of the group’s organizers, told NBC News. Activists at 23 universities have made demands to address what they see as injustice on their respective campuses. Pay attention to #StudentBlackOut today. It's revolution time. Today's #StudentBlackOut was planned by a network of black students pushing for Black freedom. @blacklibco2015 @CS_1950 we see you. #StudentBlackOut Happens on Campuses Across U.S.